The McGovern-Dole Food For Education (FFE) project is a three-year program supported by the U.S. Department of Agriculture to improve food security, expand access to primary education, promote early childhood development, and enhance learning outcomes in Cambodia. 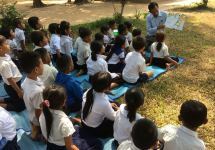 Implemented in partnership with the Kampuchean Action for Primary Education (KAPE), World Education is leading the literacy component across Siem Reap, Kampong Thom, and Battambang provinces in Cambodia. 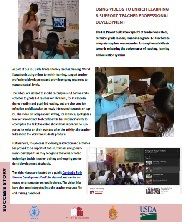 World Education and KAPE are working to strengthen teaching approaches and materials used in more than 410 schools. The project is training over 3,000 teachers and librarians on early literacy and child development, equipping classrooms with thousands of learning and teaching materials, and building the capacity of government teacher education providers, school leaders, and officials to strengthen and support teachers’ ongoing professional development at all stages system-wide.